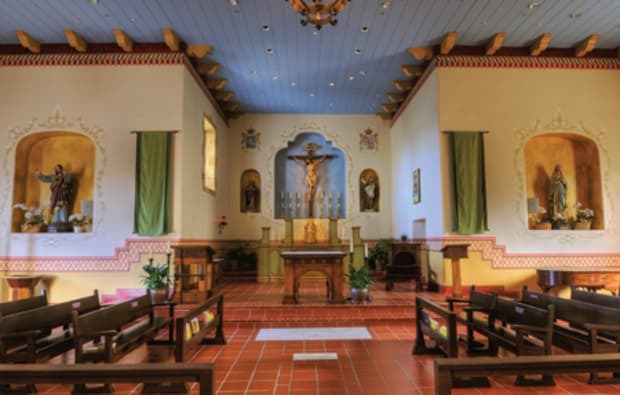 A team of architects and historic preservationists work together on restoring and seismic retrofitting the San Carlos Cathedral in Monterey, CA. 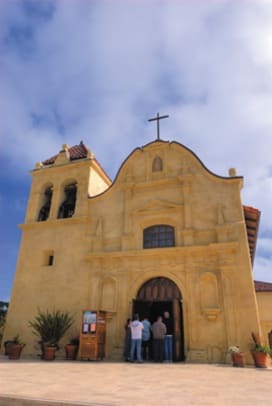 The first Royal Presidio Chapel, located on Monterey Bay, was a pole-and-brush structure built in 1770 by a Spanish military expedition charged with securing New Spain&apos;s procession of Alta California. Following three more versions in 21 years, a large portion of the current iteration of the chapel was constructed. This building – a shale construction adorned with niches, sculpture, corbels and a decorative painting scheme of Classical images – stood in fairly good shape for two centuries. 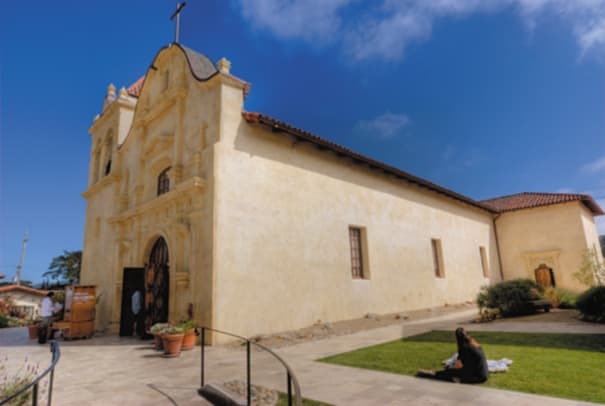 However, by the 1990s, seismic safety work was deemed necessary, and the building – now named the San Carlos Cathedral – underwent a 16-year, $7.2-million restoration effort. 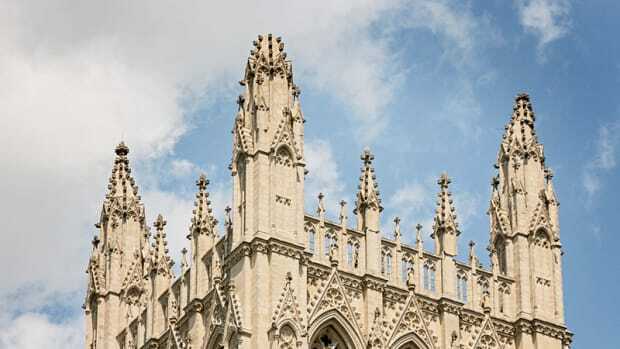 While the project was driven by the need for seismic retrofitting the San Carlos Cathedral, the structure was found to be in need of additional work. An Historic Structure Report written by Edna Kimbro in 1999 indicated moisture problems, eroding stone, cracking masonry walls and stucco, and termite damage to the attic and roof. An architectural team of Aptos, CA-based Franks Brenkwitz & Associates, Anthony Crosby of Denver, CO, Page & Turnbull, Inc., of Los Angeles, CA, and Griswold Conservation Associates of Culver City, CA, was assembled to deal with these issues and to update the mechanical equipment, lighting, and audio systems. The general contractor wasDevcon Construction, Inc. of Milpitas, CA. "Anthony Crosby was the original architect on the project, but his focus was on the exterior, so we were brought on about ten years into the project to address the interior," says John Lesak, principal of Page & Turnbull. "When we first consulted, the chapel had an antiquated HVAC system, poor lighting, and an inappropriate color scheme that created a dark, dull interior." Seismic issues were dealt with immediately, as they were the most pressing. The building had endured 200-plus years of moisture infiltration and rising damp, and thus required structural reinforcement – and, in some cases, rebuilding – of the stone walls. 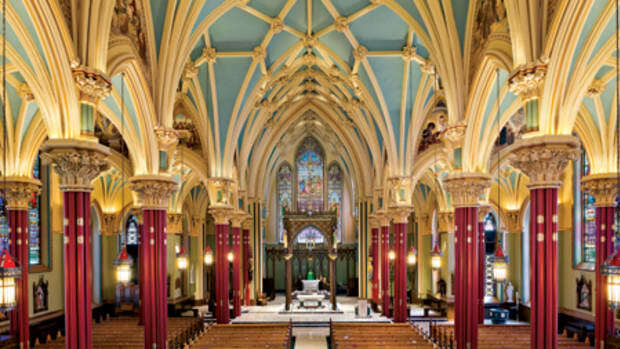 The original walls from 1794 were found to be in better condition than the transept and apse walls, which were added in an 1858 expansion of the church. Lesak says, "This was due to the cross-shaped plan, which is more unstable in an earthquake. The majority of masonry wall reconstruction occurred at the corners of the transepts and the apse." Since the stone was so soft, structural engineer Fred Webster, PE, of Menlo Park, CA, "used techniques normally applied to adobe buildings," says Lesak, "such as center-coring, installing vertical reinforcement, horizontal metal tie-rods 4 ft. o.c., and metal straps at the top of the walls." New flashing and roof drainage also aided in stabilizing the stone walls. In concert with the seismic work, inappropriate moisture-retaining finishes, such as Portland cement stucco, were carefully removed from the building&apos;s exterior and replaced with a lime plaster render, which is a lot softer and more permeable than cement stucco. Masons re-pointed the original stone rubble masonry, and where required, found local shale from the same quarry as the old stone. Lath-reinforced Portland cement plaster was also present on the interior, but as it had not contributed to the building&apos;s moisture degradation it remained in place. However, once isolated portions of the interior Portland cement and wire lath were removed to install the metal straps for seismic retrofitting, remnants of original interior decorative painting were uncovered, and Page & Turnbull&apos;s work became more interesting. Even with historic archives at their disposal, it was a surprise to find a colorful interior decorative painting scheme. "We had assumed the interior was relatively plain," says Lesak. "We had even conducted our own investigation previously, making a few select openings in the plasterwork, but we didn&apos;t find any extant finishes beneath the cement plaster. 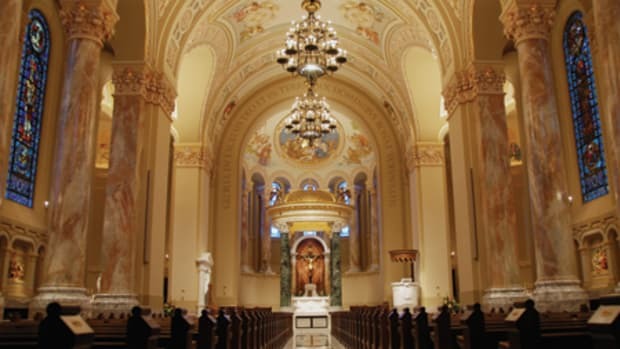 We figured all the decorative finishes had been destroyed, but when the seismic retrofit contract removed a strip of plaster close to the ceiling of the cathedral, we uncovered a vibrantly painted valence." Page & Turnbull worked hurriedly to expose and document the unforeseen decoration. "It was a scramble to get the job done quickly, because as long as we were documenting we were holding up the seismic improvements," says Lesak. Microscopy revealed four paint schemes, dating from 1794 to 1856. The second scheme was plain; the third layer, in different shades of gray, white, and red, was more ornamental; and the fourth layer was simply cream walls with an ochre dado. Page & Turnbull chose to base the new decorative scheme on the original color palette and design motifs, but not to copy them entirely. Now, painted motifs such as a polychrome valence, diamond dado and faux-stone window surrounds are exhibited. "To provide visitors with a sample of the original decoration, sections of the original scheme were left exposed and conserved in-situ," says Lesak. "Specially designed protective glass was installed as a window to the past." Much of the remaining work on the interior involved upgrading the systems. The HVAC and audio systems were replaced, and the lighting was improved for a bright and warm appearance. "The systems were seamlessly integrated into the existing historic fabric without damaging the original character," says Lesak. Another firm, Griswold Conservation Associates, preserved other historical elements. Griswold conserved liturgical elements and sculpture, including a crucifix bought from Barcelona in 1880, Stations of the Cross that date to the 19th century, and liturgical statues from Portugal. In addition, Franks Brenkwitz designed a new baptismal font, altar and reredos for the cathedral. As for the exterior, Griswold conserved the statue of our Lady of Guadalupe and removed paint from the northern decorative stone façade that had been applied in the 1980s and layers of cement plaster from the 1940s on. "The paint was trapping a lot of moisture and there was a rising damp issue," says Lesak. "To mitigate this issue, a French drain was constructed to direct water away from the stone walls."